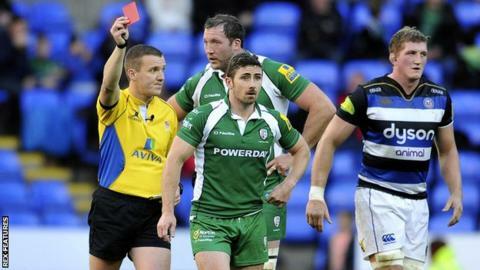 London Irish scrum-half Brendan McKibbin has been suspended for three weeks by the Rugby Football Union for stamping on Bath's Henry Thomas. The 30-year-old Scot was sent off after 20 minutes of the Exiles' 45-14 loss to Bath on Saturday. Meanwhile, Wasps prop Lorenzo Cittadini has been given a one-week ban after pleading guilty to punching Gloucester back Billy Twelvetrees on Sunday. Saracens' Jacques Burger has been given a one-week ban for bad sportsmanship.